​Joe has spent his entire life intimately involved with music. He composed his first song at age eleven, continued with classical training on saxophone from sixth grade through college, then fell in love with the Native American style flute. Joe’s fourth and fifth self-produced albums “Ethereum” (2016) and “Every Moment” (2018) both received Triple Silver Global Music Awards for Best Album, Composer and Instrumentalist, as well as many other award nominations and wins. His compositions have garnered accolades from recognized critics around the globe, and his albums continue to receive worldwide acknowledgments, radio airplay, and top chart placements. “Sheer abundance of talent,” “breathtakingly beautiful,” and “ground-breaking” are some of the words used to describe his music. Fabian Fontenelle is Zuni/Omaha. He was born in Zuni Pueblo, New Mexico but he also has family in Nebraska. Fabian is the great, great Grandson of the famed Chief Big Elk of the Omaha people. Fabian compliments The Shelley Morningsong Band by adding what has been a long history of delighting audiences from his countless travels around the world. With powerful dance performances intertwined with traditional storytelling, Fabian depicts a profound imagery of a “Spirit World” pronouncing the spoken word of his ancestors in his fluent Native Zuni Language. A performance by Fabian Fontenelle is a show in itself, a captivating display of ancient sacred songs, dancing, drumming and hand-crafted regalia adorned with the intricacy of hand-beading and more. 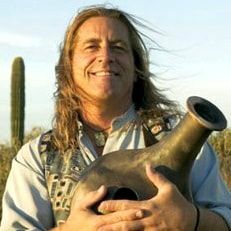 Fabian is an original member of the American Indian Dance Theatre, and also provided master-work choreography and performances with two-time Grammy Award Winning Taos Pueblo, NM acclaimed artist Robert Mirabal on tour in “Music from a Painted Cave” which was also featured on PBS television under “Great Performances”. Fabian is also an educator on the history of Native America and has done consulting work and acting for the History Channel, “Into the West” produced by Stephen Spielberg and other productions as well as education for public schools and museums. Learn more about Fabian here. "The instructors gave their all and the students responded by soaring to heights beyond their own expectations. Even the brand new students that showed up with no experience and no flutes were playing beautifully from their hearts within days. It was magical...it was mystical...and it was moving!"